1- The National Dance Championship is a national dance competition comprising of Kizomba dance, Urban Kiz dance and Semba dance styles, which is open to all nationalities, and diverse cultures in all countries. 2- This is a competition open to dancers of all levels, accommodating all kind of styles. 3- Decisions and ratings of the jury will be final and without appeal. Any form of disrespect from the participants or coaches towards the judges, the organisation and/or the public in general, is prohibited and will not be tolerated. 4- At the end of each elimination phase, the ranking of the jury will be made available in the next couple of days for interested participants to see. 1- National phases: Qualification phases will take place in the participating regions. 2- The National Final will be held in London during the Ginga Boo Kizz Festival event in UK through 4-5-6 January 2019 with the selected couples from the regional qualification phases participating. 1- Dancing couples must be at least 21 years of age, this is the minimum age requirement for participation. 2- Couples who are placed first during the regional qualifiers will advance directly to the Final of the National championship in London. 3- Contestants that continue the competition can benefit from the conditions set in this regulation. 4- Regional winners will be gaining the right to compete in the London Final UK OPEN 2019 Championship. 5- Please note that all accommodation/transport arrangement will be at contestant/competitor costs. 6- During the championship, a dancing couple can participate in any or all of the three categories. 1- At the commencement of each stage in the competition a random draw will be initiated between each participating couple to determine the order of appearance. 2- The National championships course of events will be made when the local/ regional championships are completed. 3- Dancers cannot participate as competitors and also take on a juror role during the same competition schedule. 4- During the competition there will be no direct communication between members of the jury and competitors. Any channel of communication must be made through the organisation. • All those appointed as a judge via the criteria outlined in the Promoters UK Open 2019 document. Teachers, Performers, Djs, Competition Winners. • One or more teachers will be from other style of dance ie: Bachata, Salsa, etc. • Where possible, the Head Judge of the Jurors table will be from a Kizomba, Urban Kiz or Semba background. • These judges will be appointed by the main organisation (Ginga Boo/Svpromotions) for the Grand Final, and will also be involved in the qualification phases alongside the Local organisors for joint decisions during the heats. • Free style/Improvisation to be 2.30 minutes long incorporating Kizomba/ Urban Kiz / Tarraxinha / Tarraxa / Ghetto Zouk / Semba styles. • Music will be chosen by the organisation (Ginga Boo/DJ’s/ Local organisation). • The choice of songs will be released a few weeks before the elimination events so that contestants know what the possible song selection might be. • Contestants must wear matching outfits (it does not have to be a costume). • 1 to 3 dance couples will be permitted to go through to the UK- London final. • A WILD CARD will be at the discretion of the Local organisation and Main organization. NOTE: This part requires the execution of an improvisation on the theme of Kizomba / Urban Kiz / Semba. The Resident DJ of the event will select different sections of Kizomba / Urban Kiz / Semba for each passage, which will be validated by the table of the jury of the event. The musical selection will take into account the rotation per minute and composition ofeach piece. The music pieces will only be known by the Jury's table and the organisation. This musical theme will have a duration for 1 minute and 30 seconds of Urban Kiz / Kizomba/ Semba, mixing different types of Kizomba / Urban Kiz / Semba followed by 30 seconds mixing another rhythm/ music/ style chosen by each participating couple. a) 1 '30 '' (one minute and thirty seconds) mixing different types of music (Kizomba, Remixed kizomba, Ghetto Zouk, Tarraxa, Semba, Urban Kiz). b) 30 ''(thirty seconds) which will develop their creativity, by mixing another rhythms/music/style of their choice (one or more), with the soundtracks of their choice. c) Points a) and b) combine to make up the 2 minutes’ total representation. POINT 1: Their presentation should not exceed the 2 minutes time limit. POINT 2: The use of different soundtracks and choreography must be displayed in each presentation. In the case of participants performing a choreography or using a soundtrack that they have already used in a previous presentation, then the couple will be automatically disqualified. Live music is prohibited. POINT 3: In the case of any or all of a choreography being repeated, the organising committee responsible for the performance of discipline and ethics will decide what penalty to apply. POINT 4: The Improvisation piece will be a dance that the couples will perform to a track selected by the organisation. As outlined in Part 1 noted above. POINT 5: During the improvisation phase couples are allowed to repeat sequences of the same steps keeping the improvisation goal. "Improvisation" is not considered a" social dance" and tricks to show the flair and competence of the dancers within the couple, are allowed. POINT 6: Participants are recommended not to communicate with each other, with the public or members of the jury, and to avoid singing the song of their dance theme. POINT 7: In the event of an unforeseen anomaly on the dance floor, or with the audio support, couples must immediately inform the organisation before their performance. POINT 8: Participants will keep the same number throughout the competition. TECHNICAL: mastery and execution of movements. CREATIVITY AND ORIGINALITY: use of new / different movements in the choreography. RHYTHM AND INTERPRETATION: definition and consistent use of timing during the execution of the dance and fluidity of body movements. VISUAL PRESENTATION: The couples aesthetics (hairstyle, costume, makeup, etc ...) will be judged and marked as part of the performance. CHOREOGRAPHY / CAPACITY OF IMPROVISATION: evolution of the dance, complexity, movement synchronisation with the music. 2- The organisation will provide the jury with all necessary documents in order to do an assessment following the above criteria. 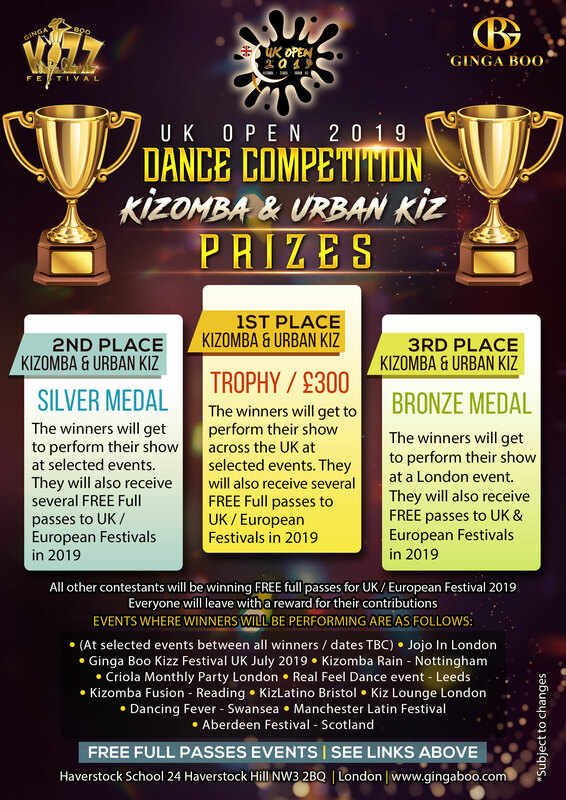 1-The couple that emerges as winners will be crowned either UK Kizomba Champions, or UK Urban Kiz Champions, or UK Semba Champions and, they will be awarded with a trophy as recognition and have their title and position announced. 2-The couples who win 1st place position will not only be given the title of UK champions, but will also be awarded a monetary prize in the form of an astounding amount of £300. 3-The first 3 placed couples will also be provided with events that will be graced with their dance performance across UK (to be confirmed). 1- The soundtrack that will be used for THE KIZOMBA SHOW – THE URBAN KIZ SHOW – THE SEMBA SHOW is the couples’ responsibility as is their choreography. 2- The music used during all phases of the competition will be a total of 2 minutes long. 3- Couples whose music does not comply with the regulations will be disqualified. 4- Participating couples will deliver their music on a USB stick directly to the DJ, on the day before, or on the same day as the competition. Any couple who do not deliver their music in one of the correct formats and within the timescale allocated by the organization will be disqualified, except in the case of exceptional circumstances. 5- Couples must have in their possession a spare copy of their music on a USB stick in case of any unforeseen circumstances at the event. 1- The jury will judge the couples according to their performance in each event, not by personal relationships or matters unrelated to the competition. 2- The jury must maintain a neutral stance during the competition so as not to influence participating couples. No signs or gestures are to be given to indication the remaining time through signs or gestures. 3- In respect of the participating couples, the Jury shall show no expression of irony, contentment, disgust or laughing. This behaviour is considered unethical.  The Non-compliance with the articles of this Regulation, will result in the couples getting a reduction of points or being disqualified from the competition and / or disqualification from the International Championship.  They may no longer participate in the competition and may be removed from the world ranking for a period of one month to one year, excluding them for the following Kizomba - Urban Kiz – Semba championship.  The weight of the sentence will be determined and applied by a disciplinary committee composed of members of the Jury and organisation. 1- For the duration of the competition, couples must confirm their participation within 24 HOURS preceding the day of the qualification competition. 2- Couples cannot participate in any qualification stage without first presenting the original of this regulation, signed by both parties responsible for the organisation (local or Ginga Boo). 3- The use of accessories and decorations will be permitted during the performances, provided they are placed and removed from the scene by the competitors themselves. 4- Costumes, makeup and hairstyle, in all events, and final qualification phase will be at the participants own cost. 5- In order to be selected for the next phase, from the qualification phases to the final, the couple will have to use different costumes. 6- In the championship final, the lighting will be the responsibility of the organisation. 7- This is an event with assignment of rights, the use of brands or products during performances, is expressly prohibited. 8- The organisation is not responsible for any loss or theft of personal items. 9- Ginga Boo/SVP does not take any responsibility and will not be liable for any injury or accidents that occur during a performance in either Stage 1 or 2 of the competition in any heat or at the finals..
10- Ginga Boo/SVPromotions reserves the right to the possession and use of any video and photography sequence or any other means of gathering sound and image communication of participants in all events in which they participate in the contest. 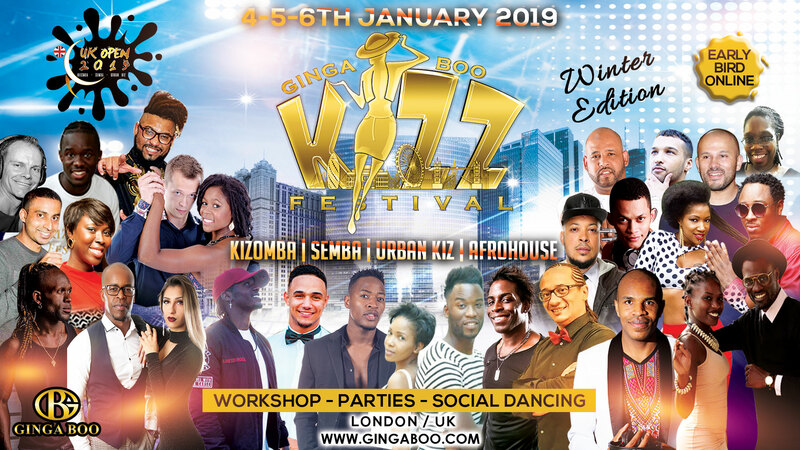 11- Couples who go through to the FINAL of the Kizomba - Urban Kiz – Semba championship must make themselves available to claims their prizes when they are approached by Ginga Boo (information will be given in advance when necessary). 12- This Regulation may undergo modifications, provided they are written down on the same document, and communicated by letter and / or e-mail to all the local organisers (regional/national), and published on the website www.gingaboo.com and Facebook of Ginga Boo, five days before the date of entry. 14- Ginga Boo organisation will have wild card to use for Meu Semba Semba competition Birmingham for the winners to enter directly to the UK Open 2019. 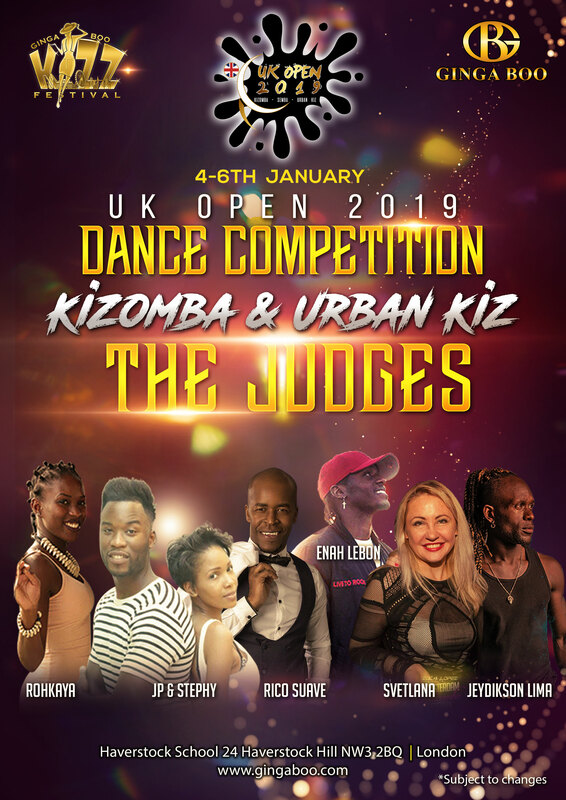 I have read and accept in full, the terms and conditions of the rules of the UK Open 2019 Kizomba -Urban Kiz – Semba Championship. I certify to be a participant, and assume the faithful commitment and strict adherence to them.